Below these reflections, I have reproduced a post from one year ago on "secularization". The problems it addresses are still very much with us. Pope Benedict knows this very well. He is not quitting in the face of this crisis. Rather, he is resigning his office in order to follow the call to seek God in prayer, to offer the sufferings of his present physical condition in humility and silence before God. It seems appropriate to revisit a point central to the eight years of Benedict's pontificate, because the secularized world cannot really understand why he has made his decision. 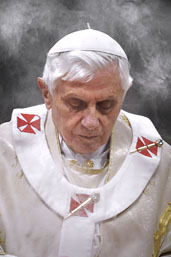 A world without God does not understand the value of prayer, and therefore has no understanding of what Benedict means when he says he desires to "continue to serve the Church" by offering himself to God in prayer. Benedict lives a relationship with Christ in the Church, and he is now turning to prayer not simply for "practical" reasons. These constitute some of the circumstances he faces, of course, but at its core his decision is motivated by the conviction that this is the path of his vocation, the next step in a lifetime of hungering for God and seeking to know Him more intimately in an ever deeper personal encounter with Jesus Christ. He knows too that this hidden life is not an escape, but a profound way of entering into a deeper communion with his brothers and sisters, a way of offering himself to Christ in the communion of the Church in the context of his present sufferings, after a long life of dedicated pastoral service. I am confident that his prayers will sustain his successor so that he can give a strong and attentive witness to the truth about God and His love for us in Jesus Christ--the truth that is everywhere attacked, ignored, or falsified with cheap substitutes. "Secularization, which presents itself in cultures by imposing a world and humanity without reference to Transcendence, is invading every aspect of daily life and developing a mentality in which God is effectively absent, wholly or partially, from human life and awareness." Secularism imprisons the human person within the confines of "the world." Sometimes it restricts itself to the world as human beings immediately perceive it (e.g. materialism). But it can allow for the affirmation of "deeper realities," and for the development of human beings and the universe under the influence of "mysterious" natural powers (e.g. the many kinds of spiritualisms that flourish today, as well as a reductionist view of religion). Secularism is a proposal of life "without reference to Transcendence." The essence of secularism is its effort to smother the deepest reality in the life of every human person, that thirst for the Infinite that shapes every human heart. The "transcendence" that Pope Benedict speaks of here is not just any kind of "going beyond" the surface of things. It is the Beyond-all-things, that Mystery which energizes the human person and is the ultimate goal of every human aspiration. Secularism seeks to suffocate this "restlessness" of the human heart. It does not forbid a person to be "religious" (provided that "religion" is reduced to a human system, or a set of rules that rest on human contrivance, whether ancient or new). It does not have a problem with "spirituality" as long as the "spirit" remains in the finite prison of its own idealism, or of the occult. Secularism is even compatible with talk about God. But it wants to eliminate the search for God, the hunger for God, and of course, love for God. Above all, however, secularism cannot abide the amazing fact that the Transcendent God --the Mystery that every human heart yearns for--has entered history and dwells among us in the very midst of our world. In the end, this is why secularism is doomed to fail: because God wills to make Himself known, because He loves us. He loves every human person, even the most determined secularists who appear to have forgotten all about Him. The witness to Jesus Christ as God's loving gift of Himself is difficult in our secularized culture. But let us never forget that His grace is at work.